Carrillo’s mother worked as a baby sitter, saving money for three years to bring her to the U.S. At age 5, Wendy said goodbye to her best friend and her school, and accompanied her grandmother — first on a plane to Mexico City, and then on to Tijuana to hire a “coyote” to smuggle them into California. 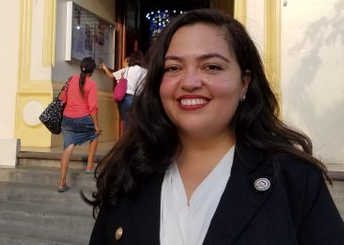 Today, Carillo — a Democratic state assemblywoman representing northeastern Los Angeles—is back, the only Salvadoran state lawmaker, and the only legislator to travel with Gov. Gavin Newsom on his first official international trip. The new governor is visiting the tiny Central American country, he says, to learn “firsthand” the reasons why thousands of people from El Salvador and neighboring Guatemala and Honduras have been seeking U.S. asylum. Carrillo talked about her family story in the 10th floor lounge of the hotel where Newsom’s group is staying — and noted that it is in an affluent part of the city that is much safer than where most Salvadorans live. She went on to earn a master’s degree in journalism from USC and become a radio host, and she handled communications for a Service Employees International Union affiliate. She lost a bid for Congress, but in 2017 she won a special election for the state Assembly in a race against 11 men.